Aeroflex IFR 2948 : Spectrum Analyzers - Test Equipment Connection - Prüfgeräte zu verkaufen - verpachten - vermieten. 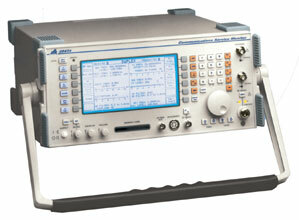 All the benefits of the 2945A but with a low phase noise signal generator, for more critical receiver testing. A compact, lightweight and rugged instrument that allows laboratory standard measurements to be conducted in the field. The 2948 provides an excellent combination of instruments for all types of maintenance work. In the workshop, it provides all of the performance you would expect for exacting measurements. Superfast LCD with rapid refresh rate for easy monitoring and real time adjustment. A variety of options are available. Contact Test Equipment Connection for details.